MS Access Error: Run-time error ‘3073’: Operation must use an updateable query. Background: While performing an update operation this morning to a table in the application the “MS Access Error: Run-time error ‘3073’ “is showing up. 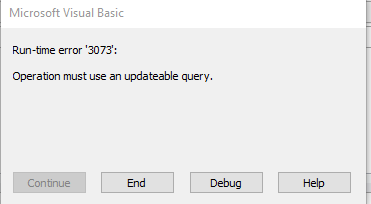 Upon investigating it seems that the underlying table where update used to be executed is missing “Primary Key” constraint. As using Oracle as backend database declaring the ID column(the PK candidate) of the table as “Primary Key” solved the issue.